The madman/genius director Werner Herzog is famous for making films in far off places which require near superhuman feats of endurance. Both Herzog and his fictional creations are frequently driven to attempt ambitious projects in the face of immense adversity, such as pulling a full sized boat over a mountain, or walking barefoot from Munich to Paris. Such feats require amazing vision and immense tenacity and Herzog has much to teach us about turning our dreams into reality. Herzog’s most famous film, Fitzcorraldo, involved pulling a full sized paddle streamer over a mountain in the Peruvian jungle. 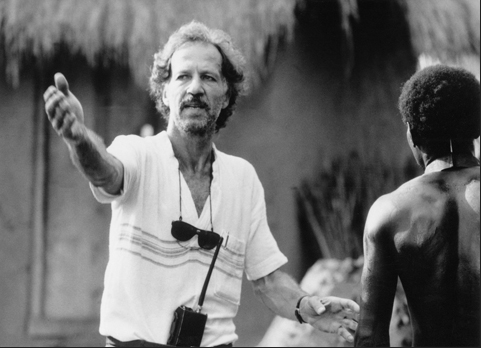 Herzog was not content to use special effects or models to complete the effect; it has to be the real thing. He believed that the act of actually pulling a boat over the mountain would bring out special qualities in the cast and crew and that they would rise to the challenge that was put before them. Be bold, set yourself big challenges. Everyone has their own boat to pull up a mountain. The message is simple, get started, you have no time to lose. Herzog famously encouraged one friend by betting him that he would eat his shoe if he ever got his documentary completed. The film got made and Herzog stood by his word. …if I abandon this project I would be a man without dreams and I don’t want to live like that: I live my life or I end my life with this project. Here Herzog reminds us that dreams are hard to achieve and it is always easier to give up. Aiming high and doing what you want to do is always the more difficult option and achieving your goals will require a great deal of hard work and dedication. However for dreamers, living life without dreams would be unthinkable. At the end of Bad Lieutenant: Port of call – New Orleans (perhaps not Hezog’s greatest work), the main character (played by Nicholas Cage), asks ‘do fish have dreams’. The meaning of this expression is never explained, but I find the question thought provoking. To me the character seems to be suggesting that even a fish, a creature that never sleeps, never stops swimming and never sleeps, has its own dream and ambitions. If this is true, then we should all remember not to give up on our ambitions no matter how hopeless the situation seems to be.